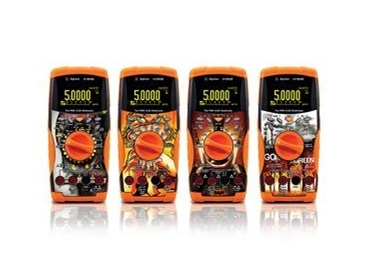 Agilent Technologies has introduced new, thematic skins for the U1240 and U1250 Series handheld digital multimeters (DMMs). The new skins allow engineers and technicians to personalise their DMMs, which are used to perform everyday measurements and troubleshooting tasks. "With portable electronics such as iPhones, Sony PSP, Blackberry PDAs and laptops getting the personal touch, why should your multimeter be any different?" asked Ee Huei Sin, Vice President and General Manager of Agilent's Basic Instruments Division. "The thematic skins of our handheld DMMs allow engineers and technicians to express themselves through their trusty DMM. It gives them a greater sense of pride when they say, 'This is my DMM’." An increasing number of field engineers and technicians worldwide are asking for measurement instruments that can be easily transported for installation and maintenance activities. To meet these needs, instruments must have three key attributes: mobility, accuracy and affordability, which are the key focus areas of Agilent's value instruments. Products include benchtop instruments, handheld multimeters, modular instruments, connectivity products and the Agilent VEE graphical programming software. Over the years, Agilent's value instruments have won numerous awards, the recent ones being EDN Innovation Award 2010 and Design News' 2009 Golden Mousetrap Award.